Kostal presented at the SPS IPC Drives 2018 its Inveor MP series of decentralized drive controllers with CANopen interface. 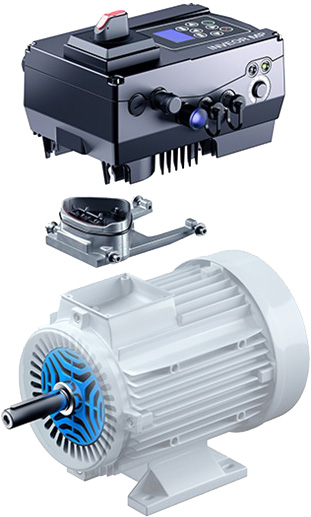 Due to the universal motor adaptation concept, the Inveor MP (Motor-mounted performance class) is suited to any motor and because of its IP65 protective class design can also be used in heavy-duty environments. The product comes with features such as pluggable connections and commissioning via Bluetooth app or PC software. The device offers pluggable M12 connectors for connection to the bus systems such as CANopen. Alongside this series, the company also presented the Inveor MP Modular at the fair, the first variant of this decentralized drive controller. Equipped with a power stack, while this device has the same performance electronics characteristics as the Inveor MP, it does not need a separate application board. Instead it has a modular configuration and can be equipped with various supplements, such as an I/O module or integrated brake resistor. Other features, such as the possibility of plugging in all input and output connections for fieldbuses such as CANopen using M12 plugs, are provided.